This is no joke; that's exactly what has happened here. Two collections of galaxies, which are called 'galaxy clusters', collided. 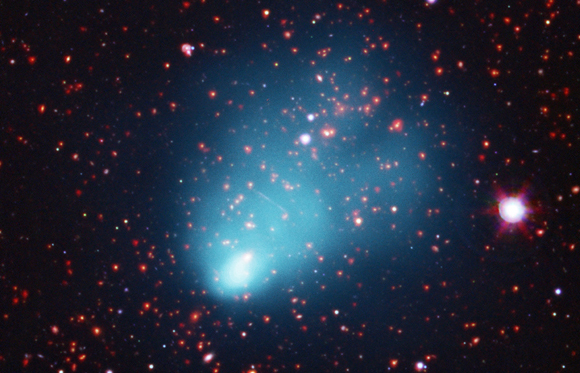 The resulting galaxy cluster that formed from the collision is called El Gordo, which means "fat one" in Spanish! To measure El Gordo's distance from Earth, astronomers used a telescope called the Very Large Telescope, which is based in the country Chile in South America. They found that it is incredibly far away: Its distance in kilometres is 66 followed by 21 zeros! Cool fact: Galaxy clusters are huge and can contain thousands of galaxies! This Space Scoop is based on ESO and NASA Chandra X-ray Observatory press releases.